areClash Royale, Supercell’s new sensation, has taken up the gaming world by storm and has given clashers something that they’ve waited for quite some time now; the excitement of real time clash where they have to attack and defend at the same time. Obviously, most of us here know this already and are regular players of the game. What’s more, all of us have recently started playing this game and are looking out for ways to increase our levels as soon as we can! Levelling up is not only for progressing in the game, it gives you certain incentives that help you in- battle. To begin with, for those of you who don’t know it already, levelling up your king means that your crown towers have more hit points. This surely demands that your opponent deal more damage to destroy it. In addition to this, as you level up, you unlock new troops, spells and defences. In short, it just makes your clash experience all the more better! So the question is, How to level up fast? You surely want to increase your level faster than your clan mates to beat them in friendly encounters don’t you? To increase your level, all you need are experience points (xp). You can check how many points you need for the next level on the top left hand corner of your in-game screen. One way to get xp is to level up your cards. Every time you level up your cards, you get some xp. For that of course, you will need gold that you can get by opening chests. Moreover, when you open a chest, you get cards for troops, spells or defences. If you have enough cards as required, you can make an upgrade and that will give you xp. Another way to get xp is by donating. This is similar to how it works in clash of clans. If you see a request from a clan mate, you can donate one or more cards and you will immediately notice that you get xp for it. As if this wasn’t enough, you even get gold for donation. So keep the philanthropy alive and keep donating! If you have been a clasher on COC like most of us here, you might be familiar with yet another way of getting xp and hence increasing your level. There are certain in game achievements that, on completion, give you gems as well as experience points. As you can see on the right of your in-game battle screen, there is a small icon like a miniature medal. That gives you the list of achievements that you can work for and with each goal, you can see the xp and the number of gems that you will get on the achievement completion. So if you recently started playing the game, there are a few things that you can do immediately to get some xp and gems. First of all, watch a TV royale replay. On your main screen, you have a pane at the bottom of your screen through which you can cycle through the different menus. The last option, with a TV icon, allows you to watch replays. 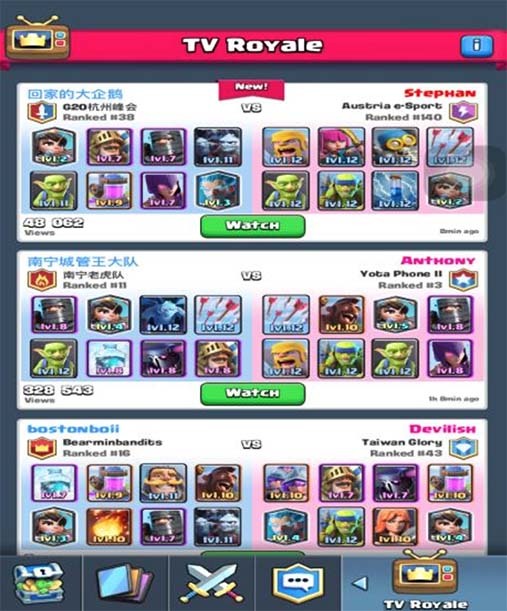 These are not just any replays; there are the real times battles of some of the top players of Clash Royale. Not only can you learn from and enjoy these replays, you even complete an achievement the first time you watch one! A reward for watching TV? What more can one ask for! Once you are done with this, you can complete another achievement to get xp. Join a clan! Trust me, this will not only get you the xp you want, but will make your whole clash experience more fun. 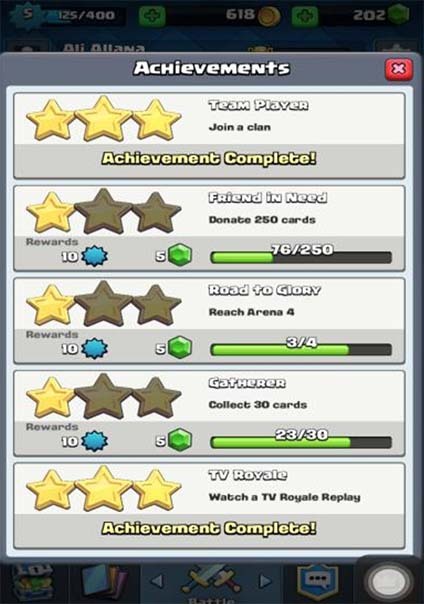 You will surely get the gems and xp for starters, but with clan mates to help you, you can level up faster than you can on your own. As a clan member, you can donate and receive cards that will be helpful for you to progress. Donating, as mentioned earlier, will get you xp. Furthermore, when you request for cards and your clan members donate, you will be able to upgrade your cards faster. In case you forgot the very first way of levelling up that I mentioned, upgrading a card means xp! While we are at achievement completion, let me reemphasize the significance of donation. Every time you donate, you get xp. As if this wasn’t enough, frequent donations allow you to complete the ‘friend in need’ achievement and for that, you get more xp and gems! So never think twice before donating; it’s all for your own good! Other achievements that you can focus on are the ‘road to glory’ and ‘gatherer’. As you reach higher arenas, you will be able to complete the three steps of the former and get xp every time (for instance, the first step is when you reach arena 2 and the second at arena 4). This is really amazing isn’t it? It is like the game is giving you gems and xp for just progressing which you will be doing anyways! The ‘gatherer’ achievement simply requires you to collect more and more cards. For that you need to open chests as frequently as you can. In order to get these chests, you have to win multiplayer battles. Also, you will get the free chest after every few hours. Let’s not forget the easiest, but the laziest way of levelling up. If you are one of those gamers who spend a lot on their games, then this method is good for you as it literally has no limits when it comes to gaining xp. 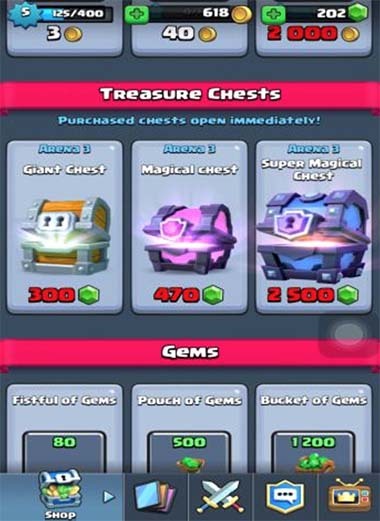 You can use as much bucks as you want to buy gems (you can also use gems that you get in-game) and then use these gems to get gold or speed up the opening of chests. 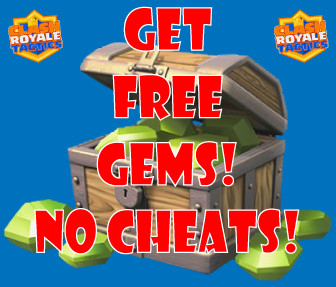 Gems are like the universal currency in clash royale and can save you all the waiting and gold deficits. Gemming means that you can open more chests (since you can buy more! ), upgrade your cards faster and get the all-so-important experience points. If you are in for gemming, there is no stopping you! WEll i like this guide. this game makes me so frustrated because you need a lot of gems to win the battle. The thing I like most about this game vs CoC is that there is no way to ‘rush’ early in the game before you really figure out how to play that will hinder your experience late game. You can level inefficiently in Royale by upgrading too many different kinds of troops (vs just focusing on the ones you like to use), but really that doesn’t matter much since you’ll find yourself at the Arena to match your play level regardless of your player level.